It is not necessary to descend hundreds of feet into the bowels of the earth to see the interior of a coal mine. Nor need one even travel beyond the Borough boundaries. For beneath an imposing building in Manners Road lie hundreds of yards of galleries, complete with tracks and tubs, shored correctly with pit props, and supplied throughout with water and electricity. This mine has never yielded coal. 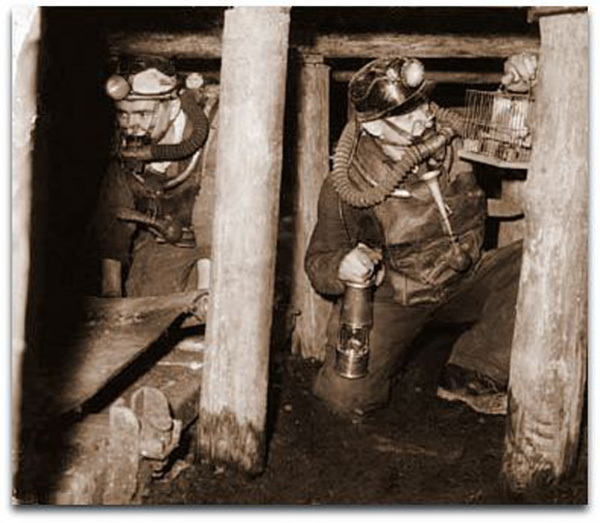 It never will; for it was dug by the men of the Ilkeston Miners Rescue Station solely for the purpose of training rescue squads in as near to real conditions as possible. Some years ago now, the brigadesmen, as they are called, to distinguish them from volunteer rescue teams belonging to individual collieries, constructed their own "mine." Using only pick and shovel, as did the miners of old, they took three and a half years to do it, adding for effect an old coal cutting machine, and blackening the walls. Apparently the station itself is built on the site of an old mine, as the tunnels were dug through layers corresponding to those normally found at a pit. Rescue teams from each of 25 collieries in the area come to the Ilkeston station for four training sessions a year and go through arduous trials in the "mine". at Ilkeston Miners Rescue Station. Phil Healey back right hand corner. 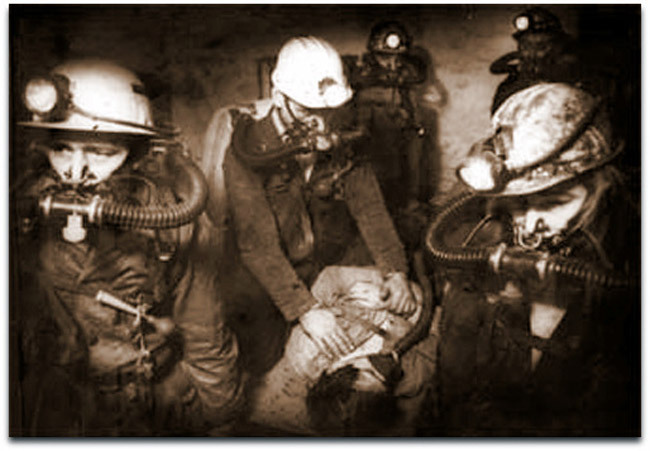 Wearing bulky breathing apparatus, the miners have to crawl through the galleries, clear away debris, and rescue dummies. Adding to the already high degree of reality, fires are lit at various points to simulate underground fires, the resulting smoke making breathing apparatus essential and vision difficult. Under these conditions the rescue workers, all volunteers, are taught to brick up or sandbag the tunnels, cutting off pockets of bad air or underground fires. Wrecked trucks are overturned as if by explosion, providing obstacles to the rescuer, already hampered in the narrow confines by his breathing apparatus. He is trained to search for possible causes of such explosions; a cigarette end or a burnt match providing ample evidence. Fire being a common cause of colliery accidents, the rescue teams are trained in fire-fighting. They drag heavy hoses through the galleries and use them to extinguish "blazes', and the resulting mud adds considerably to their difficulties. A rigorous medical examination must be passed by all rescuers, so volunteers are expected to undergo gruelling tests in the station's humidity chamber. Here, under an oppressive atmosphere, they not only do heavy physical work, but also make calculations requiring concentration of will power. An important everyday task is that of servicing equipment and here technical knowledge is most important. For example the Brown-Mills breathing apparatus is stripped right down to the smallest part each time it is used, whether in training or actual operations. Any component Showing the least sign of undue wear is replaced and the whole air circuit is washed and sterilise. Twice a year breathing and revival equipment, at every pit in the area, must also be checked. All the station's breathing apparatus uses liquid oxygen, so it proved economical to instal an oxygen-making plant on the premises. Oxygen in the Brown-Mills cylinders and in the large 50 lb containers used to replenish them, is slowly "lost" into the atmosphere, making regular checks on both necessary. The plant makes fresh liquid oxygen at the rate of 60 lbs. per hour. As the permanent rescue team is normally called out only when the atmosphere at the scene of the accident is irrespirable, breathing apparatus is all important, and has been improved considerably since mine rescue operations began. One method which has not changed with the years and is not likely to change is the use of canaries to detect carbon dioxide. A spacious aviary houses sixteen of these birds at the station, two of them being always "on duty" in a smaller cage by the rescue van, which is ready in seconds to speed to the scene of an emergency. Assistant superintendent, Mr. Albert Sheffield however, was quick to explain that the canaries seldom, if ever, died from this use made of them in detecting the presence of gas. On walking cautiously to the scene of an accident, a rescuer with the cage would stop at frequent intervals to observe the birds' reactions closely. "You can tell by watching the birds if there is carbon dioxide in the air. If there is, the canary will gape and ruffle its feathers and generally show alarm," he said. The bird is then taken to safety. As it is ten times more sensitive to the gas than the rescuer, he is, in this way, protected from the danger of being overpowered by the fumes. Collin Snape (on the left) and Ray Davis stowing newly checked berthing apparatus into the NCB Mines Rescue van which could be on the road within 20 seconds of an emergency call being received. The canaries ready by the van are an example of the absolute readiness for emergency. A portable rescue station in themselves, these vans crammed with £3,500 worth of equipment and can be on the road within fifteen to twenty seconds of an emergency call being received. Besides the inevitable breathing equipment they contain plans of every colliery in NCB Areas five and six, helmets, hoses, extinguishers, fireproof overalls, first-aid equipment and, last but not least, bird seed for the "duty canaries." At least six men form the crew, for this is the minimum number on duty at any time in 24 hours. There is always one of those sitting by the telephone to take any call. The vehicles are only called out about ten times a year now, such is the standard of present day safety underground. It might be a case of a small fire or explosion, or an inrush of water, which calls the team into action, to seal off some part of a pit. But not since the Sutton Colliery disaster has the Ilkeston station dealt with anything really serious. "It is a good organisation to have, but it is very satisfactory when such long periods elapse without any serious need for its use," commented an NCB official. He explained that in a big emergency such as the terrible Creswell disaster a telephone call would go to the nearest rescue station. Vehicles would immediately set off and, by VHF radio, call the nearest additional station (Mansfield in Ilkeston's case), which would also respond. The team would join six other volunteer teams from collieries surrounding the disaster pit and the extent of the damage would be surveyed. If it were estimated that the incident would last more than twelve hours, more teams would be ordered to stand by, and a rota formed. Rescue teams would only form part of the National Coal Board's emergency organisation scheme, however, for, controlled by the management of the emergency pit, there would be a team of scientific, medical, and clerical staff, besides fire-fighters, survey teams, press liaison officers and canteen facilities. In fact, every department, of the Board would be concerned in a serious emergency. 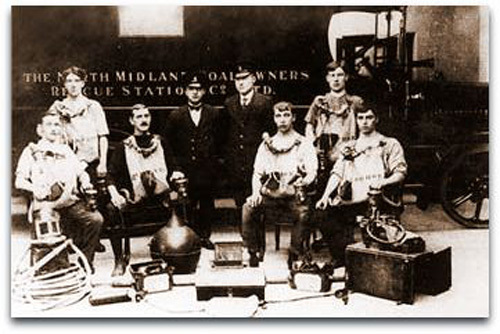 It was the 1911 Mines Act which made provision for Rescue Stations; the one in Manners Road being built in 1916. 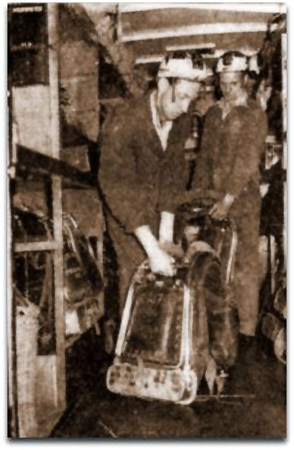 In those days various companies were obliged to set up their own organisations. The Ilkeston station was situated centrally and financed by a group of coal owners. The two officers and sixteen forming the first complement of the station soon became a familiar sight to the townsfolk of that time, driving about in their maroon coloured cars. 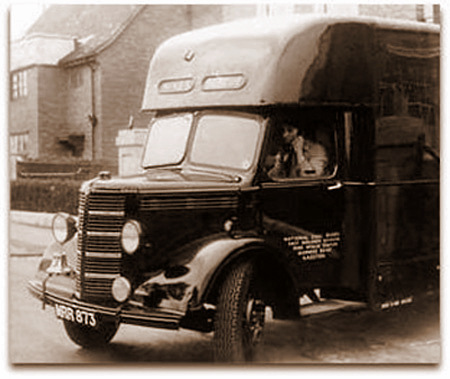 These had solid tyres, being among the first cars ever seen in Ilkeston. 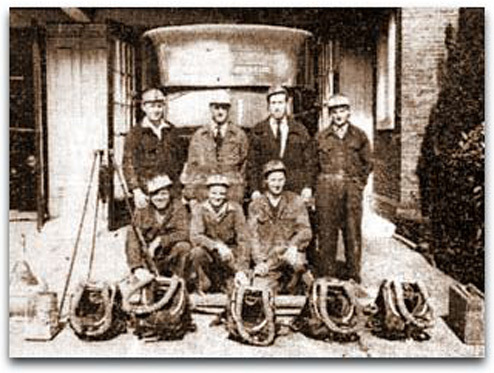 Under their superintendent, a Mr. Brackley, these pioneers of mine rescue work were often busier than their present-day successors as the mines of that period did not benefit from the modern safety regulations. Their task was made no easier as breathing equipment was not altogether adequate, being still in the process of development. Ilkeston Mines Rescue brigadesmen take a few minutes off to pose for this picture with some of their equipment. The cylinder (Dewar Flask) contains 50lbs of liquid oxygen for the apparatus in the foreground. Team, back row from left: Gordon Weston, Albert Sheffield, Barry Spencer, Alec Jackson. Front row: Terence Astle, Ray Davis, John Fitzgerald. Although there is a constant possibility of being called out of bed in the middle of the night, there is no shortage of applicants. Retirement age for the job is 45. To become a mine rescuer, one must first have had experience in working down the pit and also be trained in first aid use, commented an official. A friendly, cheerful atmosphere pervades the Station. The men know their superintendent, Mr. Harry Radford, as "Boss," and he calls them by their Christian names. Off-duty men can enjoy a game of tennis-out-doors or play billiards on a full-sized table in the recreation room, and there are excellent shower facilities. Longest-serving member of the present staff is Mr. Sheffield, of 63 Manners Road, who has been at the station since 1937. Among his experiences are rescue work in the Sutton and Creswell disasters, as well as in a more recent emergency. This came during December's floods when he was responsible for the unofficial rescue of "Charlie" a white horse which was stranded in deep water. On more than one occasion he has been awakened at night and within one and a half minutes has been in the rescue vehicle racing towards an emergency wearing only his trousers.